work collaboratively with people with a shared vision. Transition in action: supporting existing Transition initiatives and begin new ones! The process moved from my addressing my personal and learning needs at the end of the diploma, getting to know the community and local area, through to connecting existing initiatives, celebrating what has been achieved in order to create fertile ground for new actions. This process also reflected the design process of moving round the design cycle from observing and interacting to being responsive to change. Getting to know the local area and community reflects the principles of working with nature and building community reflects the permaculture principles of resilient ecosystems primarily in creating beneficial connections. The first step of the design begins at home. It represents a return to myself and my family after the diploma process and begins with my learning needs and aims for after the diploma. This will start in mid-winter and I hope to have some time off over Christmas for rest and reflection to begin with new energy for the new year. Also a focus is on our home and garden improving the sustainability of our home ecosystems. The second step is venturing outside making a practice of walking the local environment, getting to know our landscape and researching into ecology and nature’s patterns. This is also to establish a basic life practice. 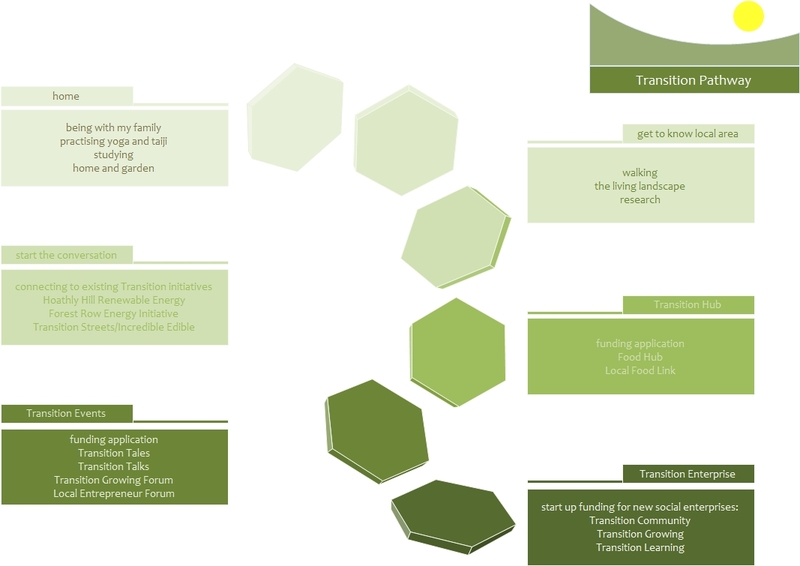 The third step is in particular focusing on connecting with local projects and the Transition movement. This is part of surveying the local environment and developing my connection with the wider community. The Energy Descent Action Plan for Totnes, identified key resilience indicators: these can provide an additional framework for the survey. This third step in the design involves the start of a new design cycle in surveying and analysing the locality to make decisions about the best options. The next steps will be informed by the first three, however I have identified key actions with regard to my personal development as well as Transition. They all fulfill the aims of this design drawn from the key points of intervention. I have also noted I am to secure funding or personal investment for the implementation of these steps. This is in order to add a further element of resilience into these new areas of work for myself and others I collaborate with. The fourth step is inspired by Mollison’s recommendation on bioregionalism and the Transition movement’s creation of local food directories. These use the information gathered in the survey stage to start local directories, thereby creating and strengthening local connections, creating a sense of place, and generate interest in local organisations and businesses. The fifth step is about facilitating events using the connections made and again creating a buzz about local, sustainable people, groups and places with funding. This is part of the process of working with existing Transition initiatives and generating interest and engagement. In the survey, I had identified and themed Transition projects I was interested in. These broad areas of interest are the basis of new social enterprises I envisage focusing on in the final step of this design: community, growing and learning. I will design for those based on the detailed surveying and analysing throughout the implementation of this pathway. This will enable me to embark on a further learning pathway after the diploma, hopefully much more embedded in my local environment and in collaboration with others, with a better understanding of the application of permaculture design!